I love high scoring game, especially when the goals are freakin cool to watch. 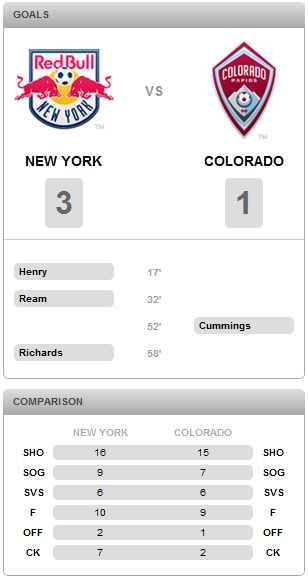 Red Bulls dominated the entire first half and the last half of the second half. Did I say half enough? Went with Matthew again, works out he’s free on the weekends that Jamie works. Was hot out but at least it took 5 minutes to get out of the parking lot and onto the main road. Literally was no traffic leaving at all, drove as if a game wasn’t even on. And they warned about increased traffic due to the Brazilian festival! Pffft!